When the first notifications about the Las Vegas shooting were sent late Sunday, the death toll stood around two people. That number jumped to 59 dead and hundreds wounded late Monday as investigators pieced together why 64-year-old Stephen Paddock of Mesquite, Nevada, opened fire from a hotel onto a crowd of about 22,000 people attending a concert along the Las Vegas strip. In the rush of this and other news, here are some stories you may have missed. 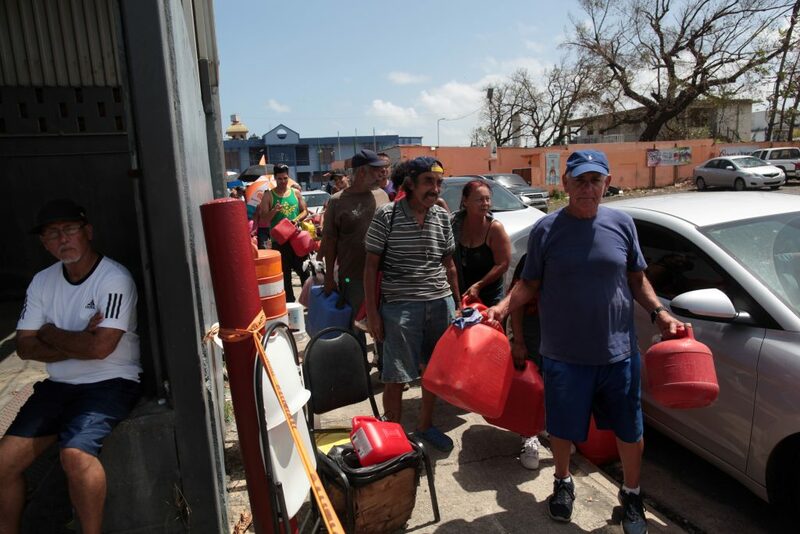 People queue at a Puerto Rico gas station to fill up their fuel containers last week as the island continues to recover from Hurricane Maria. Photo by REUTERS/Alvin Baez. FEMA administrator Brock Long said Puerto Rico is making good progress in recovering from damage sustained during Hurricane Maria. FEMA said that almost half of residents now have drinking water, with hospitals, gas stations and highways also becoming functional again. Puerto Rico Gov. Ricardo Rossello said Monday that the island is expected to receive more than 400,000 barrels of diesel and gasoline by Wednesday, Reuters reported. Much-needed fuel supplies have been slow in coming due to decimated roadways connecting the ports with the interior. And at least 95 percent of electricity customers are still without power, the Associated Press reported. Mr. Trump is slated to visit Puerto Rico on Tuesday before traveling to Las Vegas on Wednesday in response to that city’s deadly mass shooting. Lt. Gen. Jeffrey S. Buchanan, the Department of Defense’s primary military liaison with FEMA, told PBS NewsHour that Hurricane Maria left “the worst damage” he’s ever seen following a storm. Buchanan said bad roads and poor infrastructure pose the biggest challenges to aid delivery. PBS NewsHour Weekend reported that, although the rebuilding process is underway, relief efforts are “turning political” on the ground following slow aid progression and statements from the White House. Rossello said that aid is progressing to the island’s rural residents, but he was unaware of the successful “inspections” Trump tweeted about last week. We may learn more after the president’s visit to the island Tuesday. 2. After violent clashes and no Spanish support, what’s next for the independence referendum in Catalonia? People shout slogans against Spanish National Police during a gathering outside National Police station, in Barcelona, Spain. Photo by REUTERS/Yves Herman. 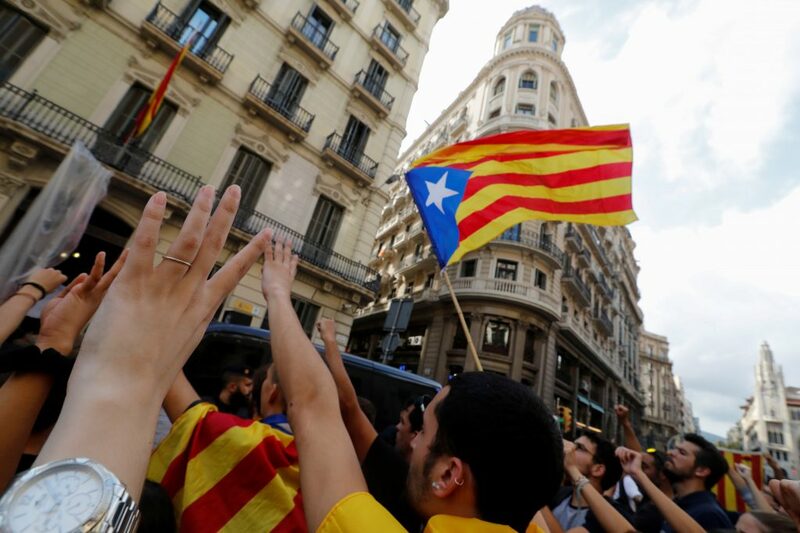 Following violent clashes between Spanish police and voters that left more than 900 injured, the rest of Europe is chiming in on Sunday’s referendum for independence in Catalonia, a region in northeastern Spain that includes Barcelona. There hasn’t been much support from the rest of Spain for the independence bid, which has been blocked by Madrid’s government and the country’s Constitutional Court. The region is not recognized as autonomous by the country’s constitution. French President Emmanuel Macron offered his support for Spanish unity in a phone call with Prime Minister Mariano Rajoy. The European Commission condemned police clashes and pushed for open dialogue, but said the referendum as “not legal” under Spain’s constitution. The president of Catalonia, Carles Puigdemont, called for international mediation. He said he does not want a “traumatic” split from Spain, and seeks “a new understanding with the Spanish state,” but that Catalonians have “earned the right to have an independent state.” Later Monday, the New York Times reported he planned to push for an investigation of Spanish police and to make the independence vote binding. The problem: While Catalonia officials said just under 90 percent of voters favored independence, it’s impossible to verify those votes, the BBC reported, or account for some 750,000 votes that may have been confiscated at the ballot box. Spanish stocks, Catalan shares and the euro fell today as a result of the referendum fallout. Rafael Catalá, Spain’s justice minister, warned Monday morning that the central government in Madrid was prepared to use its emergency powers to prevent a unilateral declaration of independence. Under Spanish law, the government could suspend Mr. Puigdemont from office, and take full administrative control of Catalonia. 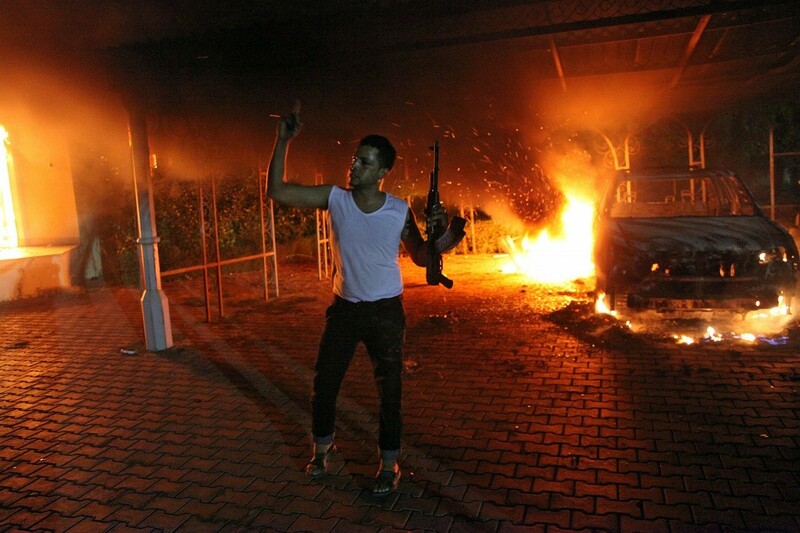 The trial of the man believed to be the mastermind behind the deadly 2012 attack on the U.S. embassy in Benghazi, Libya, began Monday. Ahmed Abu Khattallah faces 18 charges, including murder, terrorism, helping turn away emergency responders, and supervising the plunder of documents and computers in the compound. Abu Khattala waived his rights to have a lawyer present and to remain silent, but his attorneys argued that the waiver should not be granted. The judge rejected that argument. The Associated Press described the trial as “one of the most significant terrorism prosecutions in recent years in a U.S. civilian court.” The Trump administration has said terrorism suspects should be sent to the military prison at Guantanamo Bay, Cuba, rather than prosecuted in a U.S civilian court by the Justice Department. Congress allowed the Children’s Health Insurance Program (CHIP) to expire this weekend, the Washington Post reported. States are expected to continue offering coverage with funds they have left over, but eventually that money will run out if Congress does not re-authorize the program. CHIP provides low-cost health insurance to 9 million children. Before CHIP was created in 1997, 15 percent of children were uninsured. After CHIP, that number dropped to 5 percent. A spokesperson for the House Energy and Commerce Committee told The Hill that the committee “continue[s] to have bipartisan negotiations” on CHIP. It wasn’t clear when those negotiations would conclude, or whether they would reach the House or Senate floor. Meanwhile, though funding for the program won’t immediately dry up, Kaiser Health News has reported 10 states will be out of money by the end of the year. FILE PHOTO: A man purported to be the reclusive leader of the militant Islamic State, Abu Bakr al-Baghdadi. REUTERS/Social Media Website via Reuters. 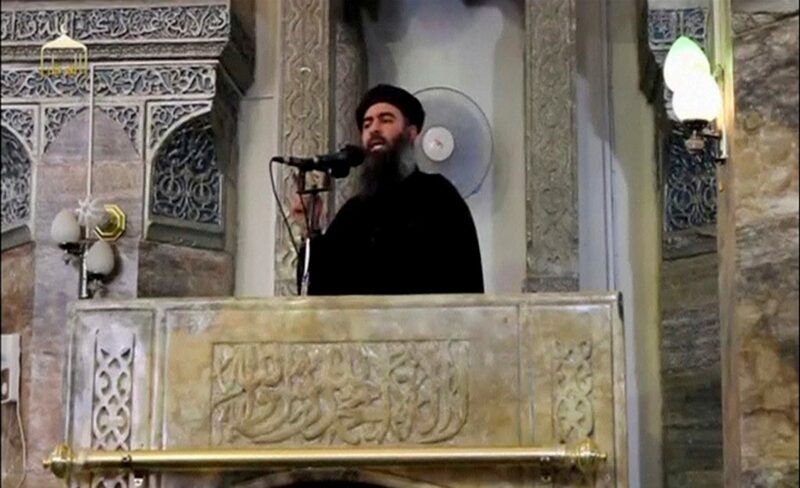 The little seen, seldom heard leader of the Islamic State group resurfaced in a 46-minute audio recording last week, The New York Times reported. Abu Bakr al-Baghdadi hasn’t been heard from since November of last year, and there have been multiple reports falsely reporting his death as ISIS fought the U.S.-backed coalition for control of Iraqi cities of Mosul and Raqqa earlier this year. As the U.S. woke up to the latest developments of the Las Vegas shooting, ISIS claimed responsibility for the attack, in which a gunman killed at least 58 people and wounded more than 500 others at an outdoor concert. But the FBI has said that there’s no known connection, currently in the investigation, between the suspect and the terrorist group. 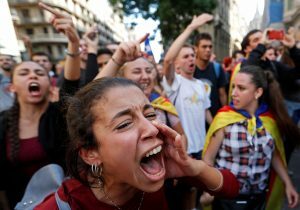 Left: A woman shouts slogans against Spanish National Police during a gathering outside National Police station, in Barcelona, Spain. Photo by REUTERS/Yves Herman.